Although skip counting by threes may seem daunting to your child at first, be persistent and patient in letting him learn each set of numbers thoroughly before moving on to the next set. 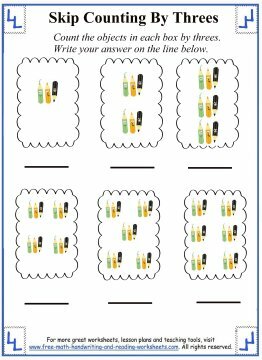 Check out these worksheets and activities to help your student learn their multiplies of 3 in fun ways! 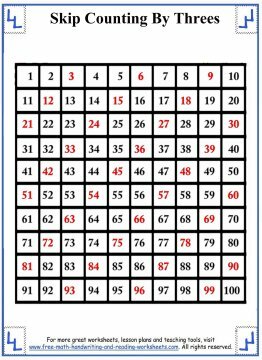 Start by printing out the number grid that highlights the multiples of threes. Go over the numbers with your child and show how the numbers in red are all multiples of three. 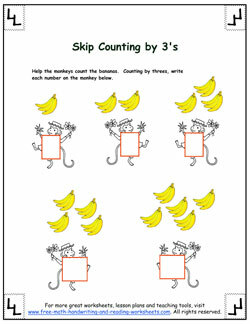 From there, you can download the worksheets and practice counting by threes. 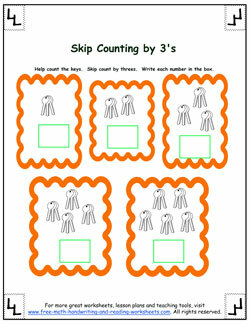 Each worksheet has six boxes that contain objects in groups of three. 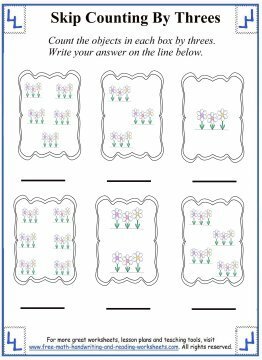 Your child will need to count the groups by threes and then write the answer on the line provided. 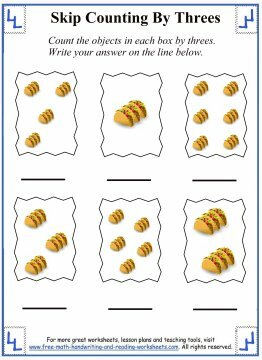 In addition to these worksheets, you can use object lessons as well, such as separating marbles, checkers or familiar small toys to practice counting by multiples. Turn daily tasks into practice opportunities. For example, as you are making supper you can pull out a carton of eggs and have your child count them by twos. If you purchase a carton of 18 eggs, you can count them by threes quite easily. This type of practical reinforcement relates math activities to practical use and makes math part of their everyday life, helping them to remember the lesson more concretely.